Large areas of the central US have spent the night under a tornado watch as severe weather puts 45 million people at risk. Two people died as the result of tornadoes which struck Tuesday, with warnings of more to come overnight. A tornado watch was issued in areas of Ohio, Kentucky, Illinois and Indiana as the Storm Prediction Center warned of winds above 111mph (179kph). 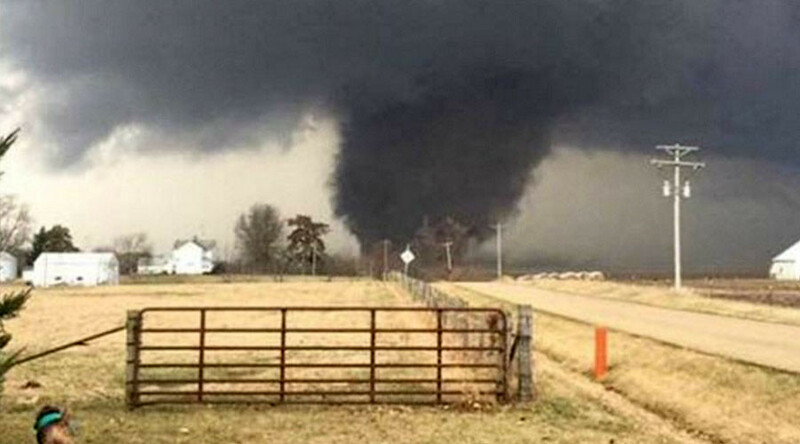 The warning comes after two people died following tornadoes in Illinois and Missouri. In Ottawa, Illinois, a woman was killed by an uprooted tree, reported WBBM, while in Perry County, Missouri a woman was killed during a tornado which caused damage to homes and lifted vehicles off the interstate. Also in Ottawa, a tornado ripped through the La Salle County Nursing Home causing damage. No fatalities were reported. The bad weather is affecting up to 45 million people across the US from Ohio to Texas. In Tulia, Texas, four homes were destroyed and nearly 1,200 evacuated when strong winds caused the rapid spread of wildfires. The fire is reportedly 25 percent contained after charring 2,200 acres (890 hectares), according to Texas A&M Forest Service spokesman Phillip Truitt.